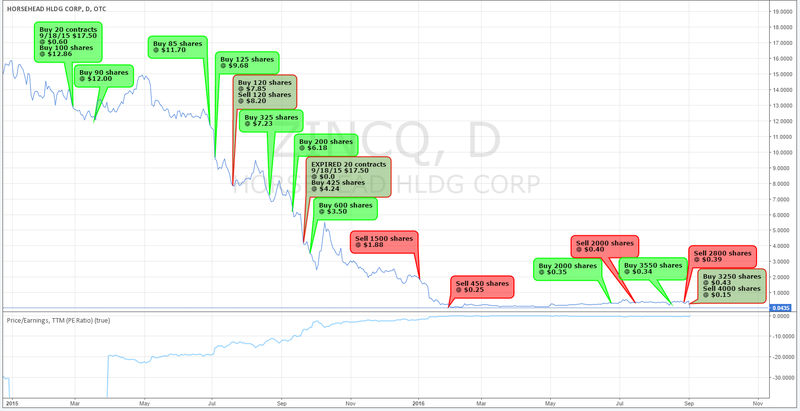 This post is about my experience owning Horsehead Holding Corp (ZINCQ) stock after the company filed for bankruptcy. I encountered many things I had not seen before in my other investments and I am sharing them here so that other investors may learn from them. For the background on Horsehead and what led up to the bankruptcy, see part 1. I wanted to know what would happen to Horsehead after they filed for bankruptcy. If the company emerged from bankruptcy with the liquidity it needed to fix the plant, I still wanted to own some of the company at the right price. I thought the long-term prospects for the company were still very good. Zinc prices were near a 7-year low, which probably wouldn’t last for long unless the global economy went into a recession. A few major zinc ore mines were scheduled to close within the next few years because they were nearly depleted. No new mines would replace them because the price of zinc wasn’t high enough to justify it. If the world wanted more zinc, the price would have to increase. Horsehead could still be a great investment if the company could eventually produce meaningful quantities of zinc and sell it at higher prices. Even though Horsehead filed for bankruptcy, it still had good prospects as a long term investment. Zinc prices rose 40% from when Horsehead filed for bankruptcy to the time of the bankruptcy plan confirmation hearing. When a company is in trouble, bondholders can force shareholders out of the company. Even a brief appearance of weakness in the company can allow this to happen if the weakness appears severe enough and the bondholders get the timing right. In Horsehead’s case, this can even happen when there is a large gap between what shareholders and bondholders believe the company is worth. Bondholders can turn company management against shareholders in bankruptcy. Judges have a lot of leeway in how they administer justice, which has a big impact on the outcome of court cases. In Horsehead’s case, the equity committee was appointed only thanks to the judge. Shareholders also received nothing because of the adjustments the judge in his valuation analysis of the company. When we hear about a legal dispute, most of us think about which side is right or wrong and assume the outcome will be based on that reasoning. After what I observed in the Horsehead bankruptcy, I am way less inclined to predict what I think the outcome of a legal dispute will be. Bankruptcy is generally very dynamic and fast paced compared to traditional investing. There is a lot more information to monitor and it takes a lot of time. Getting all of the information requires spending money. You also have to compete against other people who specialize in this area of investing. In other words, bankruptcy is a great place for a casual investor to get run over and it’s not worth the time for more dedicated investors. Very minor news, such as Seeking Alpha articles, can trigger large price swings in thinly traded stocks. Be careful about giving much weight to small insights. These might indicate something larger, but more likely it’s your own confirmation bias coloring your interpretation. There are many more intelligent, knowledgeable, and resourceful people out there trying to make money in the stock market than you realize! More brainpower and time was probably spent analyzing Horsehead in bankruptcy than was used trying to fix the problems with the plant! If so much time and effort were spent on a tiny niche company in bankruptcy, it’s likely the numerous larger companies in the stock market receive much more scrutiny! March 2016: Guy Spier, a fund manager invested in Horsehead, held a conference call to organize other shareholders to have a voice in the bankruptcy process. I listened to the replay of the call and learned that another hedge fund named Greywolf Capital had bought a large amount of Horsehead’s debt just before they filed for bankruptcy. Greywolf was stacking the deck in their favor to take control of the company through bankruptcy. There didn’t seem to be much hope for shareholders to receive anything at this point, but Guy was going to do what he could to fight for shareholders. June 2016: I didn’t notice any news on the Horsehead bankruptcy until the Wall Street Journal started reporting on it. I learned that Guy and other shareholders had persuaded the judge to appoint an equity committee the previous month even through the bankruptcy was already underway. The judge even said, “Something doesn’t smell right to the court.” With an equity committee, shareholders could now participate in the bankruptcy negotiations. I decided to buy my shares back even though the stock price was now slightly higher. I thought there was a small chance the stock could be worth something when the company exited bankruptcy. July 2016: Even though there was now an equity committee, the bondholder committee still had the exclusive right to propose a plan for Horsehead to exit bankruptcy. The judge allowed all parties to the bankruptcy to vote on the plan. Under this plan, shareholders would receive nothing. Most other parties would be paid in full, receive partial payment, or receive stock or warrants in the reorganized company. Since I had no idea what would happen if most parties voted in favor of the plan, I decided to sell my shares. August 15th, 2016: I noticed a sharp decline in the stock price one morning and checked for any news on Horsehead. I found an article on Seeking Alpha where someone with experience analyzing bankrupt companies had taken a look at Horsehead. The article seemed to do a good job evaluating the bankruptcy situation up to that day. The article concluded that it was too close to call whether shareholders would receive anything. Apparently, this was enough to send the stock price down 50% in two days. I noticed some good discussion in the comments section. Someone had even caught an error that changed the liabilities by almost $90 million. Not enough to change the conclusion of the article, but quite significant for anyone trying to estimate the risk vs. reward of holding the stock. The most important thing I learned from the article was the judge had given the equity committee permission to perform an unofficial market test. The equity committee could solicit bids from outside entities to purchase a part of Horsehead or all of it. This is what shareholders had asked for since the company entered bankruptcy with reported assets around $1 billion and liabilities of $545 million. Bondholders claimed the company was worth less than the liabilities, which would mean shareholders would receive nothing. Shareholders believed the company was worth a lot more and said they could prove it by getting someone to buy the company. However, nothing is official unless it is on paper in the court and the equity committee required permission from the judge to seek buyers for the company. The judge had given his permission the previous month for the equity committee to conduct the unofficial market test. The equity committee solicited bids for Horsehead while the bondholders collected votes for their bankruptcy plan. At the next court hearing, the judge would decide how the bankruptcy should proceed given the results from the unofficial market test and the voting results for the bankruptcy plan. The unofficial market test was the best chance shareholders had to receive anything. Companies in bankruptcy usually sell their assets at bargain prices so I believed shareholders would only receive decent bids if bidders were competing against the bondholders and each other. I thought the short deadline to submit bids would result in higher bids. August 17th and 19th, 2016: A couple new articles on Seeking Alpha were published within a few days. These articles highlighted the positive signs for shareholders and the share price quickly went back up. I was amazed how much influence Seeking Alpha articles appeared to have on the share price of this penny stock. I continued to follow the discussion in the comment section since many other readers were following the bankruptcy closely. August 26th, 2016: As the date for the court hearing approached, I monitored the online court docket for the case. A few days before the hearing, the equity committee filed objections complaining Horsehead management and bondholders had not cooperated with the unofficial market test, which resulted in only low bids. This was not what I had expected to happen at all. Although the objections were filed before the deadline for bids, it was not a good sign. I decided to sell 75% of my shares. August 30th, 2016: Once the hearing began, I monitored tweets from shareholders at the courtroom and continued to watch the court docket. Although the situation looked grim for shareholders before the hearing began, it seemed like the equity committee did very well at the hearing. I knew the limited information I received was filtered through people with a strong financial interest in the case, but it sounded like the judge clearly favored the shareholders. The judge corrected errors the bondholders’ lawyers made regarding the value of the company. The judge also told the unsecured bondholders they should have asked for more money! Appointing the equity committee in the first place was highly unusual and the judge could have put his reputation at risk. By having the unofficial market test run concurrently with the plan vote, it seemed like the judge was trying not to hold up the bankruptcy process while giving the shareholders as much opportunity as possible to show there was good reason to throw out the bondholders’ plan. When I connected these dots, I thought the judge was clearly leaning in favor of shareholders.I knew there could be other dots I wasn’t aware of, but I thought it was unlikely these “anti” dots were numerous or large enough to reverse my conclusion without me hearing something about them. August 31st, 2016: During the hearing, the equity committee claimed they had found an alternative source of funding to keep Horsehead going if the bankruptcy took longer. This was critical to me. I believed the equity committee could prove the equity had value if they had more time, but time was limited by the cash burn during bankruptcy. Horsehead would run out of cash in a month or two and I was worried the judge might approve the bondholders’ plan simply because there was not enough time to form a new plan. With a new source of funding, this was no longer a problem. I didn’t know how legitimate the alternative source of funding was. The fact that it seemed to appear at the last minute cast some doubt. But even after I discounted the certainty of this funding, it seemed like this would be a good enough reason for the judge to give the equity committee more time to look for buyers. Of course, additional funding would increase the debt of the company and reduce the value of equity, but this still increased the probability that shareholders would receive something, even if that something wasn’t as much. The share price was still less than $0.50 and I thought shareholders might ultimately receive $1 or $2. September 1st, 2016: After the closing arguments had been presented, I knew there wouldn’t be any more information for the judge to make his decision. I wasn’t in the courtroom, but I thought I had a pretty good sense of what had been presented and how the judge had reacted to some of it. I decided to buy enough shares to double the size of the position I had held before bankruptcy (My allocation was based on my total portfolio, not my pre-bankruptcy position, but the pre-bankruptcy position is a convenient reference point). The judge would give his ruling the next day and I expected my shares would either rise in value significantly or fall to zero. September 2nd, 2016: On the day of the ruling, I watched the stock price and Twitter very closely. The stock price dropped about 50% in minutes before I saw any news on Twitter. I knew this practically told me the result, but I prefer to trade based on information rather than stock price movements. Once twitter reported the bad news that the judge had ruled against shareholders, I immediately sold all of my shares. I was quite surprised by the ruling [see my previous post about surprise]. Everything I had observed and considered led me to conclude there was a good chance the judge would give shareholders more time to find a buyer. Let’s review what I believed before we examine what the judge said. Horsehead filed for bankruptcy protection because zinc prices had crashed from over $1.00/lb to a 7-year low of less than $0.70 per pound in the second half of 2015. Now that zinc prices were back above $1.00/lb, Horsehead was a much more valuable company. Although Horsehead faced the near-term challenge of fixing the problems with the plant, the problems could be solved with time and money. Once the problems are fixed, Horsehead will be one of the lowest-cost zinc producers in the world, which should make it an attractive long-term investment. Greywolf Capital was a major Horsehead shareholder before 2016. Late in 2015, Greywolf bought a lot Horsehead bonds. Now Greywolf was trying to take ownership of Horsehead through bankruptcy. Greywolf wouldn’t do this unless they believed they could make a significant profit from owning Horsehead. Greywolf wanted others to believe Horsehead wasn’t worth much so they could get the company for a low price. In bankruptcy, the company managers are supposed to try to maximize value for all stakeholders. One way for management to do this is to let others know the company is for sale and try to sell some or all of the company for the highest price it can. This was the opposite of what Greywolf wanted, so Greywolf prevented Horsehead’s management from selling the company. I did not know what the bankruptcy laws said about this, but it seemed so unfair that I thought the judge would try to remedy this. When Horsehead filed for bankruptcy, the financial statements showed the company owned $1 billion worth of assets. I knew the intrinsic value was less than $1 billion, but the bondholders (Greywolf) argued for a value so much lower that it seemed absurd. Initially, the bondholders said Horsehead might be worth less than $300 million. After objections from the equity committee and other parties, the final bankruptcy plan increased the value to $447 million. Even in his ruling, the judge said Horsehead was worth much more than this. I thought it was so obvious that Greywolf was trying to acquire Horsehead for a low price through bankruptcy that the judge would be reluctant to let this happen. Now let’s look what the judge said in his ruling. I’m glad the judge believed it was a difficult decision because this was an unusual bankruptcy. “And had the lenders taken what I believe would have been a more reasonable position and actually allowed for a true market check in this case, I think we’d be in a very different situation, good or bad, but we’d actually have some evidence other than expert valuation testimony that the Court could rely on in making this very important and significant decision. “A true market check” refers to putting the company up for sale. The judge wishes there had been a true market check, but apparently, it’s entirely legal to prevent it. I can’t really complain about this decision since I didn’t know the laws governing it. I’m still surprised it’s legal given how selfishly and unfairly it seemed to be used for the benefit bondholders in this case. The judge agreed that even though the equity committee was unable to obtain serious bids after trying to sell the company for about 45 days, this did not indicate the true value of Horsehead. I’m glad the judge believed this because he could have viewed it a different way. On the other hand, the fact the judge believed the debtors responded vigorously to inquiries from potential buyers suggests the judge was not as skeptical of Greywolf and Horsehead management as I was. I read both the equity committee’s complaints and the bondholders’ responses. While I don’t think bondholders or Horsehead managers turned away any purchase inquiries, it seems like they discouraged potential buyers. Since the bankruptcy began, Horsehead management had always acted as if Greywolf had promised to pay them well if they helped Greywolf take over the company. It was not in Greywolf’s interest to sell the company, so its seems naive to believe they responded vigorously. Either I was too skeptical of Greywolf, or perhaps the judge was not skeptical enough. Either way, this suggests I was mistaken when I believed the judge could see that Greywolf was trying to take control of Horsehead through bankruptcy. I was very pleased to read the judge viewed the burden of proof this way. He was genuinely interested in protecting shareholders. I was worried the burden of proof was the exact opposite. If it was a tie, spending more time to determine the value of equity would cost more money, which would ultimately decrease the value of that equity. Confirming the plan was the fast and easy thing to do. I’m glad the judge thought protecting shareholders was more important than doing what was convenient. Without an official market check, I thought it was too difficult to determine whether equity had value or not. The value of equity ultimately depended on the price someone was willing to pay. A difference of $50 million could result in roughly $1 per share or $0. That’s why I believed the judge would not approve a bankruptcy plan at this hearing. I thought he would ask for an official market test to determine the value of Horsehead. The equity committee had found alternative financing for Horsehead that would cover the time it would take to conduct a market test. It didn’t seem like there was a good reason for the judge not to do this. The bondholders’ bankruptcy plan valued Horsehead at $447 million. The equity committee valued Horsehead at $843 million. The judge went over the different valuations, made some adjustments, and came to $653 million before counting the roughly $100 million needed to fix the plant. I agreed that $447 million was too low and $843 million was optimistic, but $653 million seemed arbitrary. The judge adjusted the value down by $95 million based on assumptions about the capital structure of the company after a few years. He reduced it by another $84 million by assuming the maximum production at the plant could never be increased. I thought the original design of the plant had allowed for this expanded production capacity to be added in the future. I agreed that the $843 million dollar value needed to be adjusted down, at the very least by the $100 million required to fix the plant. I don’t know whether $550, $650, or $750 million was the right value, and I don’t think anyone else really knew either. Ultimately, it depended on what a buyer would be willing to pay. That’s why the judge was so frustrated that no true market test had been conducted. The judge knew he was ruling solely based on valuation analysis, which is inherently arbitrary. This is why the stock market exists. Just about every person can come up with their own value for what they believe a company is worth. In the judge’s own words: “If I’m going to confirm this plan, I have to make a finding that it’s more likely than not equity is out of the money. If I can’t figure that out, if it’s a tie, or if equity’s thesis is more likely, then the plan can’t be confirmed.” At the beginning, he said that it was one of the closest calls he’s had to make. Yet in the end, the judge chose to rule based on his own valuation analysis. Maybe I shouldn’t be so surprised. After all, most people believe their own valuation analysis is correct and everyone else is wrong. I have a hard time finding anything I should have done differently for my trades of Horsehead during bankruptcy. Based on the information I had at the time, when the price seemed to undervalue the reward vs. risk, I bought. When the price seemed to overvalue the reward vs. risk, I sold. I tried to base my decisions on what I perceived was the likely outcome of the bankruptcy process, not on what I thought the company was worth. I did misinterpret or at least overweighed some information. While the equity committee was seeking bids for Horsehead, the bondholders’ lawyers created a document that requested all bidders to include the same minimum information with their bid. Other shareholders interpreted this document as evidence there were multiple companies submitting bids and I agreed with this interpretation. It turned out no firm bids were actually submitted. If I faced the same situation again, I don’t think it would be wrong to make the same assumption. I would give less weight to “evidence” like this since it could end up not indicating anything at all, as it did in this case. I also misinterpreted other signals. Around the same time, the chief financial officer (CFO) resigned from the company, effective the day after the hearing would begin. I thought this indicated the CFO believed the company would be sold and he would be out of a job. The company was not sold, so the CFO must have resigned for another reason. The final signal I misinterpreted was Guy Spier tweeted articles from Seeking Alpha which suggested Horsehead was a good investment. Guy was the head of the equity committee, so it would not have been appropriate for him to comment on the status of the case. I thought of two reasons why he might tweet these articles: 1. Guy couldn’t buy or sell Horsehead stock without violating insider trading rules, but he wanted to help other investors profit from what he knew by highlighting these articles without giving out any information himself. 2. He could be trying to draw attention to the case in the hope of finding more buyers or increasing public scrutiny. I had thought it was reason 1, when, in fact, it was actually reason 2. In retrospect, reason 1 seems like a forced explanation caused by my own confirmation bias. I would not have based my investment on any one of these three signals, but together they seemed to paint a favorable picture. On the one hand, I should probably be careful in the future not to interpret three weak signals as a strong signal together. On the other hand, sometimes three independent weak signals can be a strong indicator of the likely outcome. Was my position size appropriate? Unlike my trades before Horsehead filed for bankruptcy, I did not allow my position after bankruptcy to get too large. I was disappointed with the final outcome, but the money I lost did not have much impact on my portfolio. This was the first time I followed a company in bankruptcy. Compared to the value investing I usually do, the bankruptcy process was fast paced and very dynamic. There was way more information to go through and many small decisions to track. As much as I enjoyed digging through some of this information, investing in the stock of a bankrupt company is probably not worth the time it takes. Digging through the information definitely gives you an advantage over the people who don’t bother, but it’s still not worth the effort in most cases. That’s because there are a lot of other people who dig through the information, too. This was the most significant lesson I learned from this experience. When I first bought Horsehead stock a year before they filed for bankruptcy, I imagined I was buying a stock that had probably been overlooked by many institutional investors. The market cap was relatively small ($750 million) and Horsehead was a niche metal production company. After the company filed for bankruptcy, the market cap shrank to about $20 million. At that size, the institutional investors were definitely gone. I figured the only people trading the stock were probably momentum penny stock traders. I found out how wrong I was when I started reading the comments under the Seeking Alpha articles on Horsehead. A lot of other individual investors were monitoring the bankruptcy. Some had bought before bankruptcy, some had bought after. Most had followed the company for a while even when they didn’t own the stock. I was amazed by the sophistication and knowledge of many of these investors. This was the first bankruptcy experience for many of them, but a few seemed familiar with this area of investing. This experience has permanently altered my view of investing. Yes, there are plenty of investors who trade without knowing very much about the companies they buy and sell. There are also far more investors out there who do as much work as me (or more) than I had previously believed. From now on, I will no longer assume that I know more than the other people buying and selling the companies I invest in. Sometimes the stock price of a company is influenced more by people who don’t know much about the company, but more often it’s bright people who know a lot about the company who determine the price. When you make an investment, it’s easy to think you know more than the people on the opposite side of the trade, but that’s probably not true. A more accurate view is that the people on the other side of the trade are intelligent people who know just as much or more than you do and they believe the company is worth more or less than you do. During bankruptcy, Horsehead was a company with a market cap less than $20 million. This made it too small to be worth the time for anyone with more than a couple hundred million dollars to invest. And yet, look at how much time and collective brain power was spent analyzing Horsehead during bankruptcy. And that only counts the people I was aware of on Seeking Alpha. I’m sure there were other people trying to make money on Horsehead stock who did not make their thoughts public. If so much time and analysis were spent on a tiny niche company in bankruptcy, the scrutiny applied to larger companies must be several orders of magnitude greater! Many of the people watching the Horsehead bankruptcy very closely only had thousands or tens of thousands of dollars invested in it. Trillions of dollars are invested in the world markets so you can be sure a lot more resources are applied to research and monitor other companies. This last lesson was hammered into my head on the day of the ruling. I was regularly refreshing Twitter for news on the ruling. Twitter was where the latest news from the hearing had been posted first for the last few days. It was also public so anyone monitoring it would find out the news at the same time. I noticed Horsehead’s stock price began dropping rapidly several minutes before the news hit Twitter. By the time the news was on Twitter, the stock price had fallen more than 50% on very high volume. Who could have known about the ruling and sold before the news was available online? There were many shareholders at the court hearing. The court even needed an overflow room for them. Most of these shareholders were small shareholders, but they must have owned enough shares to justify traveling to the hearing. Had they driven the stock price down? They certainly knew about the ruling before the internet did. It wouldn’t surprise me if some of these shareholders were able to sell their shares from their phone in the courtroom. However, my guess is that most of these shareholders did not sell their shares until they got home. The largest shareholders were on the equity committee in front of the judge and it would not have been appropriate for them to trade shares while the court was in session. The vast majority of the shareholders at the hearing didn’t care about receiving a few more cents for their shares. Most of them had invested before bankruptcy and wanted to get back dollars per share, not cents per share. They had held on to their shares with the expectation they would receive nothing if the judge did not rule in their favor. That’s why I doubt they were trading from the courtroom. *I don’t know if using courtcall to trade is considered insider trading, but it could be. Please don’t use this example as a reason to do it. I’m not responsible for the consequences you face if you do. Thank you for reading this write-up! I hope you can learn something from my experience.